Welcome to the latest edition of road.cc’s buyer's guide to urban and commuting cycle clothing in which you’ll find everything you need to know to find the right urban cycling gear for you, plus our pick of the best urban kit. In this updated version of our guide to civilian-looking cycling clothing we've added the Osloh Lane Jeans and Rapha Hooded Rain Jacket II. The last few years have seen a boom in clothes that work well on the bike but also look normal when you're off it, so you can sit in the pub or at your desk in your riding gear without people think you're waiting for the start of a Tour de France stage. Here are some of our favourites. Let's get this out of the way: you don't need special clothes to ride a bike. If you're nipping to the shops, or riding any fairly short distance, then whatever you're wearing will be just fine. For a ride of up to around five miles any old clobber will do unless you're determined to crack Strava segment records on the way. But there are plenty of situations where you want to ride for longer but not have to faff about changing clothes. Meeting friends at a country pub, say, or a longer ride to the office on a Spring day. That's where dual-purpose clothing comes in: you can ride bike comfortably while wearing it, and you'll still be comfortable at work, the pub or even at a nice restaurant. Dual purpose gear differs from both regular clothes and sportier cycling gear in a number of ways. Classic cycling gear (which really means cycle-sport gear) fits tightly because if you want to go fast, your biggest enemy is the air. To cut through it, you want clothing that flaps around as little as possible, and that hugs your (hopefully) lean and lithe body. Dual-purpose gear is less figure-hugging, though careful tailoring usually means the fit is more sharp-suit skinny than grunge-band guitarist; you still want as little flapping in the breeze as possible, especially round the ankles. Even though dual-purpose gear isn't skintight, it's still cut and shaped to fit properly when you're on the bike. That means jackets and shirts with longer sleeves, cut to fit when you're reaching for the handlebars, and a longer back. Dual-purpose trousers are similarly tweaked, with high waistbands, a built-in bend in the knee and often a strengthened crotch to cope with wear from the saddle. There are other details that mark a dual-purpose garment, such as ways of cinching the trouser cuff to keep it out of your chain, and vents in jackets to keep you cool in warmer weather. One of the things that's enabled the boom in dual-purpose clothing is the development of some very clever fabrics. There are breathable, water-resistant fabrics that look and feel like cotton, for example, and stretchy cotton blends that repel water — very handy for trousers. But one of the fabrics you'll find a lot is a variant of a textile humans have been using since the Bronze Age: Merino wool. Merino's very fine, soft fibres make it comfortable against the skin, it still insulates when it gets wet and it takes a lot longer to get smelly than synthetics with similar properties. You'll find it on its own in jerseys, shirts, tights and undershirts and in blends with synthetics in jackets and socks. Look out for SportWool, a combination of Merino and polyester that's soft and warm, but easier to care for than 100% Merino. The whole point of dual-purpose clothing is that it doesn't look like cycling kit. The available styles cover a vast range, from simple t-shirts to classy dress shirts, from jeans to suit trousers and from casual Harringtons to super-smart jackets. Some manufacturers have even teamed up with top fashion designers to offer complete suits. Read our guide to commuter bikes. Findra's Caddon jersey is an all-British offering, designed in Scotland and manufactured in the UK (although the merino is New Zealand's finest). With a dropped back, thumbholes and a drawstring cowl neck, it's a stylish, lightweight and soft option for both on and off the bike. The Caddon is Findra's mid-layer offering, although its lightweight weave means it would work equally well as a baselayer. Interestingly, it weighs a few grams less than the baselayer we have also reviewed. During the winter it was tested much more as a baselayer, but it looks good enough on its own during a cake stop in a warm cafe. Primal's Rhapsody hoodie is a surprisingly versatile bit of kit that's comfy and has a fantastic fit. Effectively the Rhapsody is a casual hoodie that the Primal team have technicaled (is that a word?) up a bit. Mainly they've addressed the fabric and the fit, with a couple of other subtle nods to active wear. Figure hugging but with a slimline polo collar, this jersey also features a concealed zipped 'security' pocket within the rear panels. It’s 10% merino, 53% polyester and 37% CoolMax. A lovely classic-style jersey with plenty of length in the body. It’s made from 100 per cent merino wool, which explains the price tag. It's more toward the cycling end of teh spectrum, but decent-looking nonetheless. Read our review of the Jura jersey. About as comfy as a casual riding jersey gets. 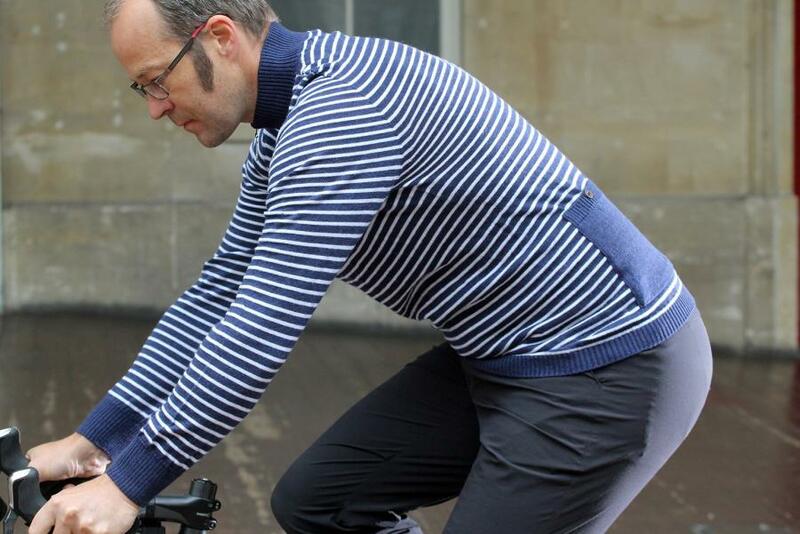 As with the Jura jersey above, it’s 100 per cent merino wool and our reviewer claims it can be worn for weeks at a time before it needs washing. There are three buttoned pockets at the back, a neck zip and springy merino cuffs and waistband. The only real downside is that the sizing’s a bit odd and so some might struggle to find something small enough. Read our review of the Meccanica Stripe. Osloh's Lane Jeans are very high quality, and have a wealth of bike-specific features. In spite of that they're not obviously bikey, and you can wear them out and about without getting a second glance. They're comfortable both on and off the bike and fitted very well. They're not without their issues, but they're easy to recommend. Osloh's Traffic jeans are also well worth a look. You have plenty of cycling jeans to choose from. Rapha, Vulpine, Swrve, and even Levi's themselves make denims for the bike. 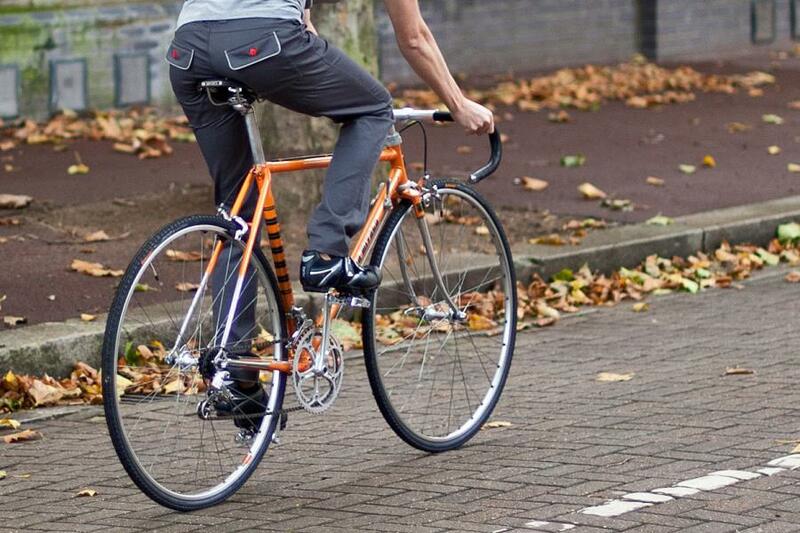 Resolute Bay is trying to make the ideal cycling jeans, aiming to marry fashion with comfort and practicality. Its NX1 jeans are well on the way to achieving it. The major difference from your average high street jeans is the crotch gusset. This features a flat panel instead of the junction of seams you'd usually find. These seams are the primary reason most people find jeans uncomfortable to ride in, as they end up between your 'sensitive areas' and the saddle. The flat panel design here, often found on other cycling trousers too, removes this discomfort. The seams and joins are still there but they've been moved out to the periphery. The overall effect is that the jeans are a whole lot more comfortable to ride in. Rapha's straightforwardly-named Cotton Trousers are lightweight, simple looking and designed for everyday use, whether it's on or off the bike. They look as good with a pair of trainers and a T-shirt as they do with a smart pair of shoes and a shirt for more formal occasions. Despite unacceptably being labelled a ‘pant’ this is a very well thought out garment that's smart and comfortable both on and off the bike. The fabric is a stretchy synthetic mix which keeps its shape well and while the inner surface is a brushed finish that’s comfy next to bare skin, the outer face is treated with a water-repellent coating that'll shrug off drizzle and showers. Furthermore, there's no uncomfortable seam at the crotch and the bottom hem of each leg has a poppered band to allow you to hike in the material for when you’re on the bike. Annoyingly, they're currently sold out and Showers Pass UK tell us they don't know when they'll have more, but suggest that if you want something comfy to ride in you check out the £73 Showers Pass Track Trousers. Read our review of the Showers Pass Rogue Pant. The successor to Rapha's well-regarded Touring Shorts, these are made from stretch fabric and have a high back for on-bike comfort. They're pricey, but attractively styled and comfy with or without cycling shorts underneath. Read our review of the Rapha Touring shorts. Simple, slightly 'mod' trousers which are cut long for leg extension when on the bike and tightly at the ankles so as not to catch in the chain. The back is cut higher than the front and again, there are no seams at the crotch. A tiny hint of lycra delivers that crucial stretchiness. We like the men's version too. They're are a well made, robust and good looking pair of cycling jeans that perform well on the bike and look good off it. 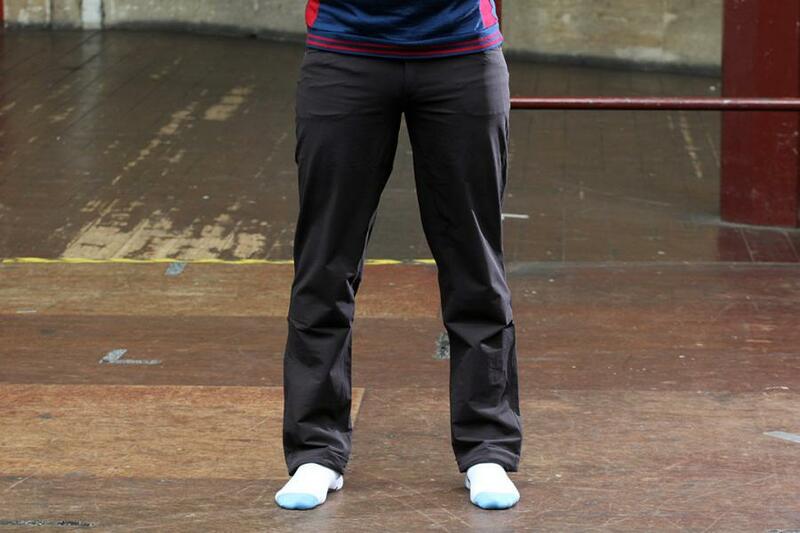 The thing that tends to set cycling-specific trousers apart from regular ones is the reinforced crotch. Here Velocity has used a diamond shaped piece of material that covers the seams at the top of the inside leg and through the crotch – typically the areas that wear out quickly when riding in normal jeans. If a clothing maker gets this wrong it can make the trousers look a little strange when you're off the bike. Happily, here it's relatively subtle, so they look good off the bike too. Rapha's Hooded Rain Jacket II is a fantastic waterproof jacket for about town – on the bike and off it. The first thing to point out about the jacket is that it's brilliantly waterproof and breathable, with a hardiness that belies the shots that you see of it here. The fabric is thick, almost softshell-like, and that adds real resilience. Galibier's Bédoin jacket is designed as a casual jacket that you can wear on and off the bike. It's a really nice quality option for casual riding and just knocking about when it's cold, and it's great value to boot. Galibier uses the same full-membrane, three-layer fabric as the Mistral foul weather jacket, so it's a technical bit of kit, but the cut is more casual for day to day use. It's a lot more roomy than Galibier's on-bike gear, and the cut is squared off so there's no dropped tail. As you'd expect, the style of the jacket is that of a classic Parka. All the typical hallmarks are present and correct: hood, dropped hem, minimal features, and a relaxed fit. It doesn't look like any cycling jacket out there on the market, but that's the point – it's not meant to. It's what's under the bonnet that counts and this jacket certainly has a few tricks up its well-thought-out sleeves, including the showpiece (and backbone of the Lumo range): the integrated lights system. If you commute by bike over the winter months, you'll know it can get pretty nippy either end of a working day, as well as dark. It an also be chilly at lunchtime, when you might be walking to the sandwich bar or around the shops. To help you cope with the conditions, you need a jacket that'll keep you toasty and visible on the bike, cosy and warm off. Combining warmth with a smattering of other handy cycling features, the Endura Urban FlipJak Reversible Jacket is the perfect candidate for the job. The FlipJak is a lightweight, insulated, reversible jacket designed for everyday use in chilly climates, on or off the bike. It's an all-occasions kind of jacket, and that's certainly been proven in the month or so of testing. It's perfect for a stroll around the shops, walking the dog, or an early morning two-wheeled blast through town. Many, many riders swear by mountain bike style double-sided SPD pedals for commuting, and the walkable recessed-cleat shoes that go with them. The Giro Petra VR Shoes are designed for those times when there's going to be a fair bit of walking as well as riding, and when a more low-key looking shoe may be the thing. But they're still technical. Officially in Giro's 'dirt' section of the company's website, the Petra VR is more a touring or casual shoe, rather than a technical mountain bike shoe. They lace up, have a Vibram sole, and feature a removable plate under which lurks SPD attachment points, but they are styled much more casually. The men's equivalent is the Rumble VR. Quoc Pham makes a wide range of stylish shoes that look as good off the bike as on it. The Fixed shoes have a plain rubber sole, with no mounting points for cleats, so they're highly walkable. What you see is what you get: a lovely looking lace-up shoe made from leather, with a rubber sole. There are no technical features to speak of – foot in, do up laces, ride. Snappy looks aside, the only nod to any hint of modernism is the reflective silver strip on the heel. There's an alternative to a clipless pedal systems or shoes for clips and straps, and it's the combination of flat pedals and super-grippy shoes that's been honed to perfection by mountain bikers over the last couple of decades. Five Ten started out in rock climbing shoes, before bringing its sticky rubber sole technology to bikes, and its shoes are super-popular with the dirt set. For round-town riding, they have the big advantage of being easy to walk in, so you can hop on and off the bike at will. No cycle specific casual socks? How about some black slim fit jeans with stretch fabric from Tesco's for 18 quid? I did couple of thousands of miles in them already. A lot of that junk is damned expensive for what it is, and over £100 for a top, get lost! You previously reviewed Swrve (skinny fit) cycling jeans. I bought a pair. They are great. Fully Recomended. 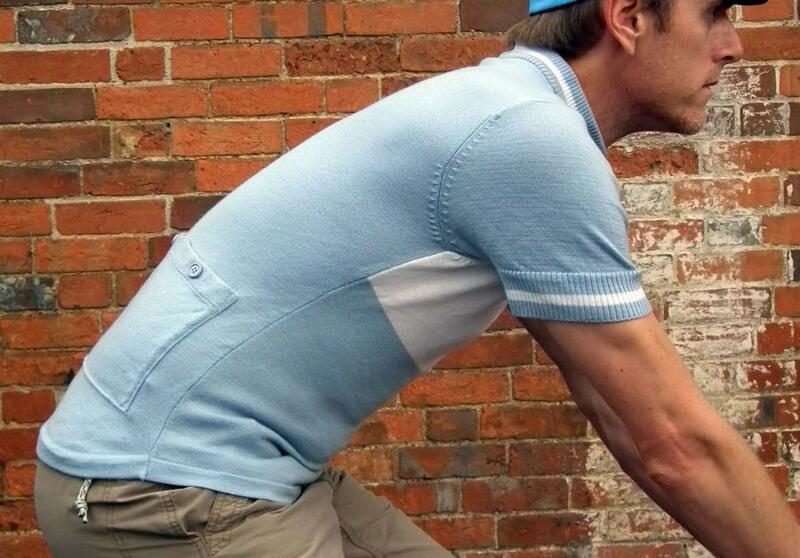 I like the look of that retro cycling wool jersey, but £125!?! No, I think I’ll pass. The last few months, I’ve been commuting in primark stretch straight leg jeans (£10) and Dunlop black canvas running shoes (£17 from sports direct) and a t-shirt from mountain warehouse (£17). Now the weathers warmer, the jeans will be replaced with a pair of mountain warehouse ‘Long shorts’. I treated myself to a Walz cap, but otherwise I think the most expensive garment I wear on the bike is a several years old goretex rain jacket. Yes, I have to doublethink the ethical consequences of shopping in primark or sports direct, but your ‘casual commuting’ clothing recommendations are far too rich for me and I don’t imagine that I’m alone in that. The Endura polo shirt is the only thing in that list I'd ever contemplate buying and even then I'd probably size it up if it was for general wear losing some of the benefit. The rest... well... lets just say I don't think I'm their target market. I tend to just throw on a breathable T-shirt and I'm good to go. My Aldi MTB hoodie is also good for a pub run when it is a bit cooler. Impressive ! Hows the crotch holding up ? +1 for just clothes for the commute.